We are instrumental in providing our clients with quality assured range of Bain Marie. This Bain Marie is designed to facilitate serving of various food items in various commercial kitchens that are consumed hot. 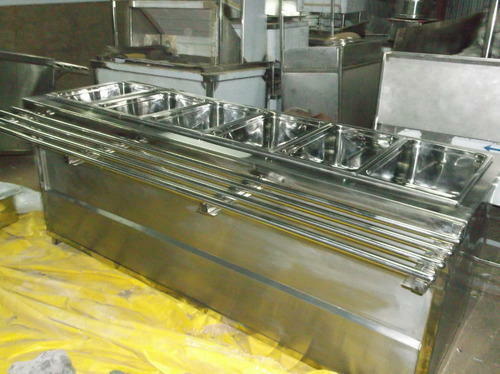 We are giving this Bain Marie on numerous specifications as per the demand of customers. This Bain Marie is supplied to numerous commercial kitchens hotels, bakeries, restaurants, hospitals, and in many other places. Established in 2010, Sre Ayyan Industries is engrossed in manufacturing, supplying and trading an elegant assortment of Kitchen Equipment. The range of products we offer includes Steam Cooking Equipment, Steam Cooking Unit and Commercial Kitchen Equipment, among others. As renowned service providers, we are offering end-to-end installation and post-sales services. While adhering to industry-set guidelines, we utilise only latest tools and technology to fabricate our products, which are appreciated for their corrosion resistance and durability. Moreover, our Product Line is crafted with 100% stainless steel. Our designated quality control unit works round-the-clock to ensure spotless products. With more than five years of expertise, we have amassed a vast clientele that includes India’s topmost Commercial Kitchens, Hotels, Restaurants, Banquets and Industrial Canteens, Institutions and Bakeries. Our in-house designers and technicians are operating out of a state-of-the-art facility which comprises of innovative machinery and modern tools. We have established a large distribution channel that allows us to carry forward timely delivery of consignments.